Are you new to Redeemer? ​You will find a warm welcome when you step through the doors of the Church of the Redeemer. Everyone -- and we truly mean everyone -- is welcome. Come as you are and experience Redeemer's friendship, spirituality and acceptance. Here are some frequently asked questions to help you on your journey to get to know us. When is our service and how long does it last? 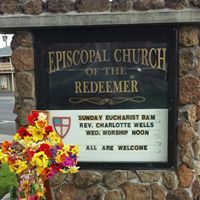 Redeemer has one Sunday service which begins at 9 am and normally lasts about 75-90 minutes. We love to sing so every verse gets its due! After Sunday service we enjoy coffee hour in our parish hall. There is also a Wednesday service at noon in Jackson Chapel. There is no dress code. Come as you are.....really! ​We love kids of all ages. In the church there is a kids corner with rockers, chairs, stuffed animals, books and toys. In our parish hall we have a kids crafts table with more toys and books.